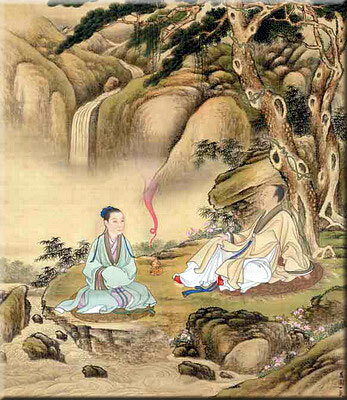 Tao Te Ching is a handbook of wisdom written by Lao Tzu at the request of Yin Hsi, the Guardian of the Pass. Many think it is about moral conduct of ancient Chinese people or a collection of mystical receipts to life prolonging or of ideas related to the birth of the universe, and so forth. In short, nothing concerning the interests and needs of modern Westerners excepting the scholars. This is completely wrong. The Tao Te Ching was written for the one who needs a good guide to the everyday living. A method of conduct based on intuition and control over our wishes. – Tao and Te – I already talked about them, see the corresponding section of the site. – Wu-Wei – that is, the art of doing (things) without forcing. – Wu – translated as emptiness (void) – relates to the art of emptying the mind and control the desires. – Fu – the Return which is the Tao course. – P’u – that is, making everything simple and trying to keep the simplicity (of our given nature). – The water principle – that is, the art of serving many without having to diminish him/herself and also the art of avoiding using force and nurture the long enduring. -The valley spirit – that is, the power of creation and regeneration of the Void (Wu). This is seemingly a reference to old Taoist practices to enjoy a never ending and healthy life. – The art of governing without governing (in the sense of the Confucian), like Huang Ti would have teach. As you see there are many teachings addressed to the modern man too that give the Book its reputation of unequalled handbook of wisdom. All of these teachings made the summary of the email course created by Master Jhian, named Lao Tzu and Tao Te Ching Revealed. You may order this course right now from the Google Play Books and start your spiritual study of Tao and Taoism. Just click here to access your Google account and follow the instruction.